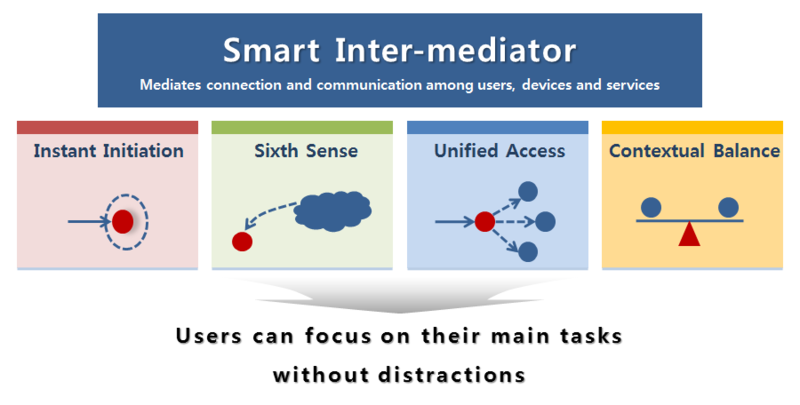 We designed an intelligent wearable UX, which we named Smart Inter-mediator, meaning that the wearable devices should mediate connection and communication among users, devices and services in a way that the users can focus on their main tasks without distractions. We designed 7 major concepts, and developed prototypes for three of these concepts: Linkage Manager, Smart Notification and Double Play. Linkage Manager: Users can mainly use their wearable devices to connect all other devices. The Universal Queue (UQ) is carried over on wearable devices so that they can be used in any other devices (even on other people's devices or public devices). Smart Notification: Since many devices are connected these days, it gets very annoying when notifications and alarms ring on both mobile and wearable devices. This concept determines which notification will be given to which device with which method (display, sound, vibration, etc) based on each device's current status. Double Play: It provides application specific functionality on wearable devices so that users can have better productivity. For example, when a user launches S-Note application on one's Galaxy Note, it detects the user is wearing Galaxy Gear and automatically launches a palette app, which could change brush types and colors of S-Note, on the Gear so that the user can use one's Gear as a palette. Pace Maker: It provides users to compete with a previous record of their own or friends. Real-time coaching and feedback is provided to users through wearable devices. My Emblem: Users can represent themselves through emblems on wearable devices. Each emblem is given only to users who have completed missions required. For example, New York 10K Marathon 2014 emblem would be given only to people who have officially finished the 10K run during the event. Luv-dub: The name is a combined word of Love and lub-dub. It provides a simple and non-linguistic communication method through wearable devices. Instant Scrap: Users can easily capture or mirror certain parts of screens of other devices to wearable devices so that they can quickly check afterwards.